About half way through September, I took a trip to visit my friend Dave’s uncle’s James farm where he had been growing 20 hop plants. Of the hops that were planted, only the Zues and Cascade hops had any significant harvest. 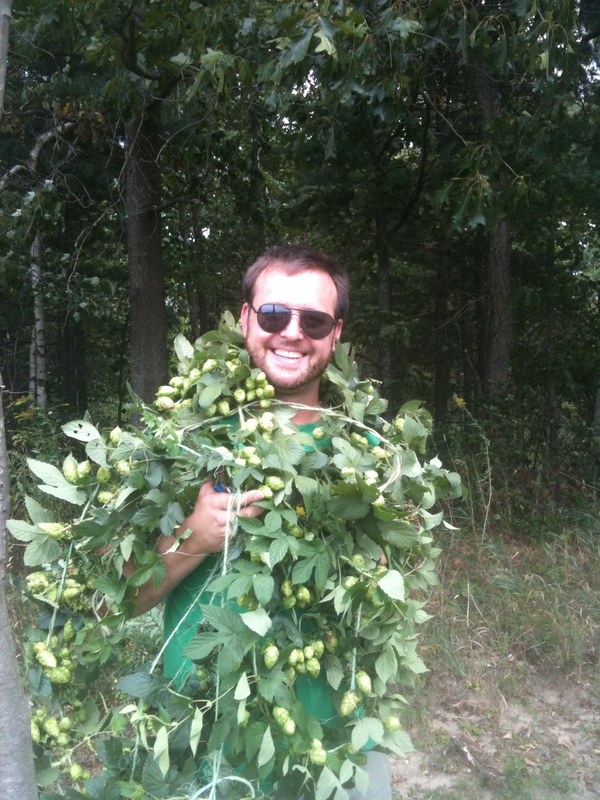 Harvesting the hops was fun, but the vines caused a mild reaction with my skin. Next time I wont treat the vines like a necklace. From this harvest, we had enough hops to brew a 10 gallon batch of pale ale. The Zeus was used for the bittereing, cascade for the flavor, and a blend for aroma. Zues was also used for dry hopping. Appearance: Amber to orange and clear enough to see through it. Nose: A lovely biscuit bread malt sweetness with a calm citrus hope aroma. Flavor:A medium bitterness with a sweet malt backbone holding the pale together. A bit too estery in the mid mouth. 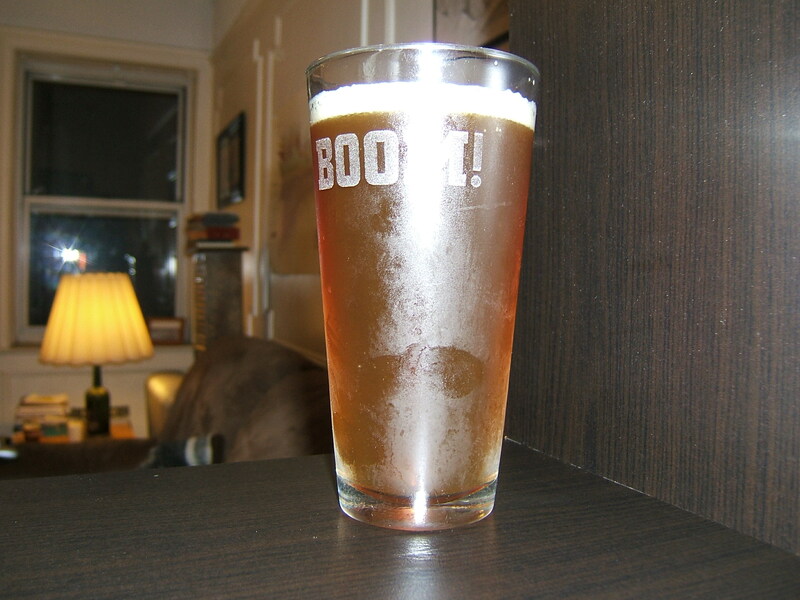 But an easy finish makes this beer a real easy drinker. 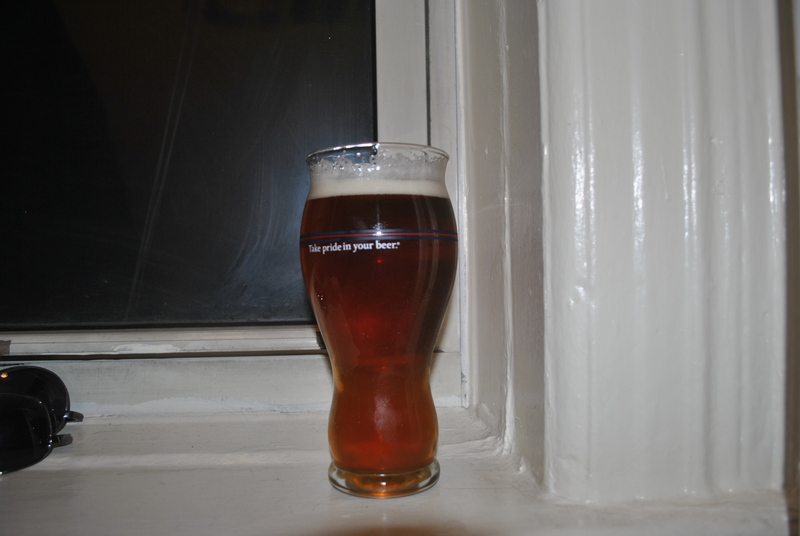 Thanks to the forced entry into the homebrew hobby by the main author of this blog, I like most have continued to advance this passion over the 5+ years that I have been brewing. 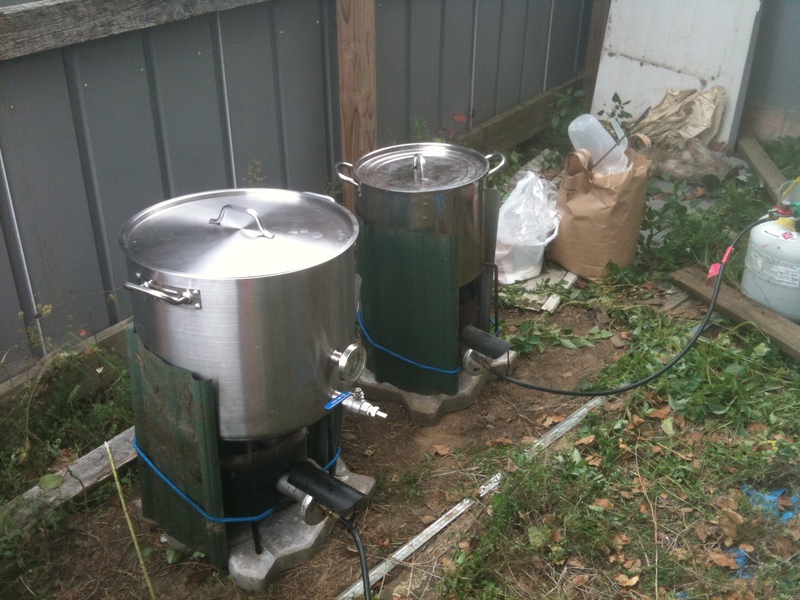 Transitioning from extract to all-grain to larger batches etc., it wasn’t till I left NYC that I got the opportunity to add the next phase of homebrewing: hop farming. I have always loved to grow things, but my current location fortuitously puts me 15 minutes from our family farm in Schaghticoke NY (it is the correct spelling) and the current location of our new business of growing 4 varieties of hops: Cascade (2nd-year), Sterling, Mt. Hood, and Zeus (all 1st-year). 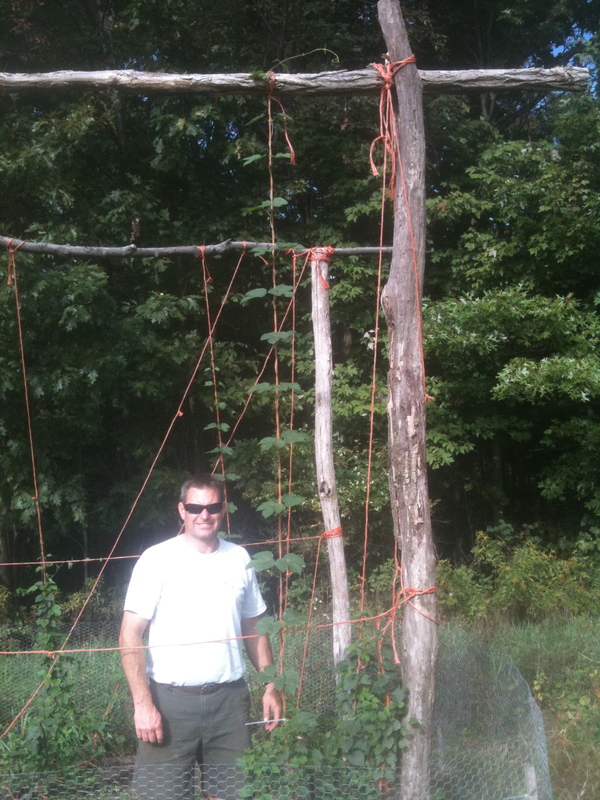 Two years ago we decided to devote a small plot out of 4+ acres available to growing hops. 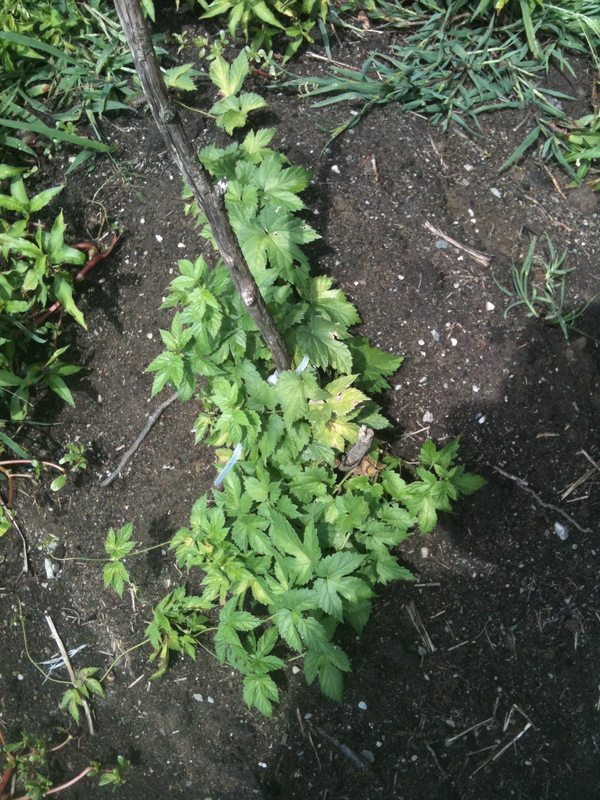 The first plantings were 6 Cascade hop rhizomes purchased from Northern Brewer. I knew cascade hops would grow well with little fuss in this area and chose them to start. That first year we had better than expected cone development considering the first two years are really devoted to developing the root system of the plant, with full yields happening after the 2nd year. With these I made a dry-hopped, estate bottled IPA with mixed results (mostly because it was my first time actually making an IPA). Needless to say, it was a good learning experience and we wanted to plant more varieties to expand our portfolio. Last year we bought 3 new varieties: Sterling, Mt. Hood, and Zeus. 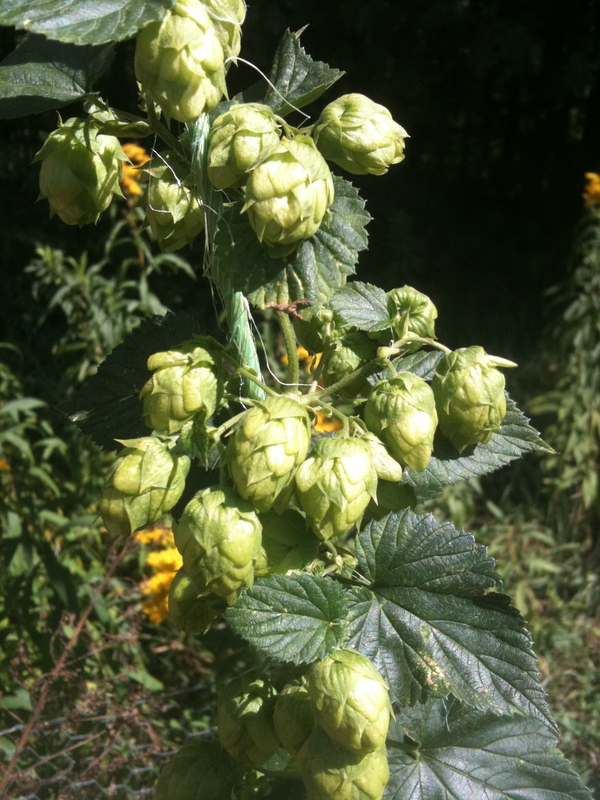 We were debating whether or not to actually buy the “Noble” hop varieties as we brew mostly lagers, but ultimately decided on hybrids knowing that they would still grow well in NY climate and be more resistant to pests. They also have larger yields, which is always nice. I also wanted a high alpha acid hop and settled on Zeus although never actually brewing with them. 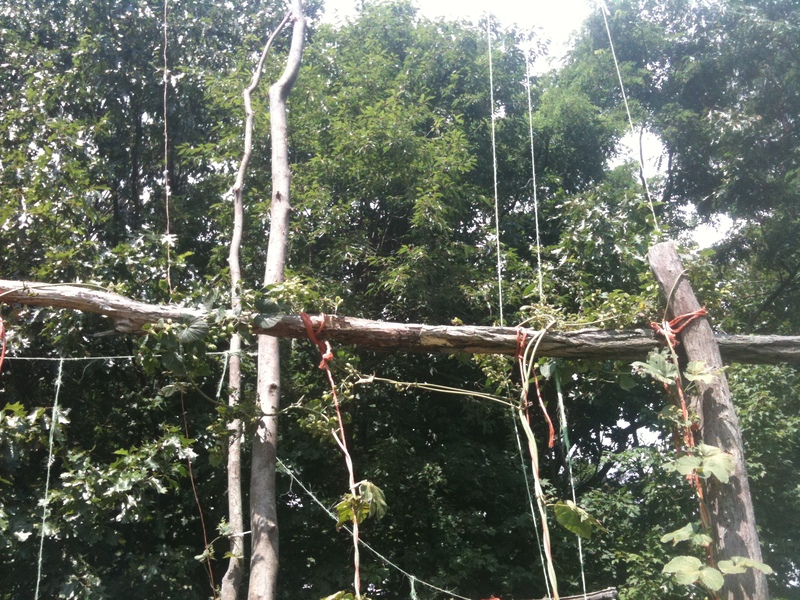 In addition we trumped our original trellis system and constructed 22-foot tall trellises using maple saplings. 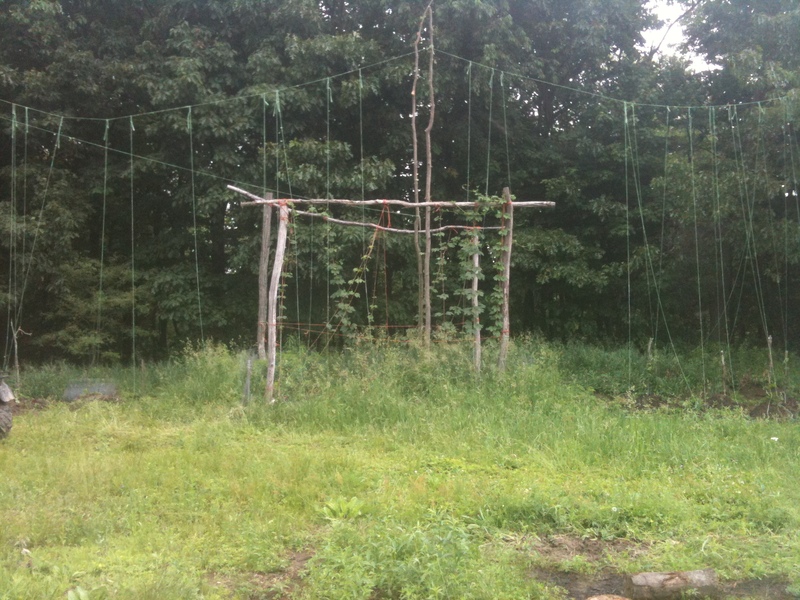 22 feet high is the normal standard for hop fields and we were excited, except for the fact that our 2nd-year Cascades grew at an astounding rate: 2 feet in one day was our maximum growth rate that we have calculated thus far! The 2nd-years grew so fast that they outgrew their original 14-foot high trellises that they were trained on and before we could train them onto the new 22-foot trellises. This proved disastrous in terms of our yield, as the plants will begin to grow downward in search of a new line and then back up. It’s a learning experience right? We still have more cascade cones than one brewer would need. The first year plants didn’t grow as well as the cascade plants did in their first year with the exception of the Zeus variety. The Zeus plants are on par with the cascade plants. We did have a scare regarding pests. We have seen aphids and caterpillars, along with what might be certain fungi, and during one check-up, our hops did not look happy. As newbies to hop farming, we didn’t know what exactly was negatively impacting our plants. We had a very dry July, and luckily August has had more precipitation and the plants have bounced back. Therefore it seems that pests or lack of nutrients were not the cause of our plants being unhappy, especially since we try to be as organic as possible. The Sterling and Mt. Hood varieties have been more troublesome and they don’t seem to want to grow upward. We were confused by this but basically have concluded that these varieties just might be a bit slower the first year than the other varieties. We see no issues with pests, or water, nutrition, etc. at this point. No matter how often/hard we tried to train them to strings, they just remained “bushy”, with a few exceptions. Hopefully they will be happier next year and demonstrate more “typical” upward growth that we saw in the cascade variety. Sadly, it doesn’t look like we will see cones from the Sterling or the Mt. Hood this year. Of course there is still time left. Growing hops now for 2 years has been an interesting journey. Obviously its great in that we get to use our own hops, dried or fresh, straight from the farm, but it is also a lot of work to train and maintain the plants. We continue to educate ourselves in this practice and try to consult with professionals in the field. We are also in contact and are following those pushing to make NY State #1 again in hop production. We are very excited about the new Farm Brewery Law (http://open.nysenate.gov/legislation/bill/S7727-2011&#8243; http://open.nysenate.gov/legislation/bill/S7727-2011) that will help push hop production and homebrew/craft brewing in NY even farther. 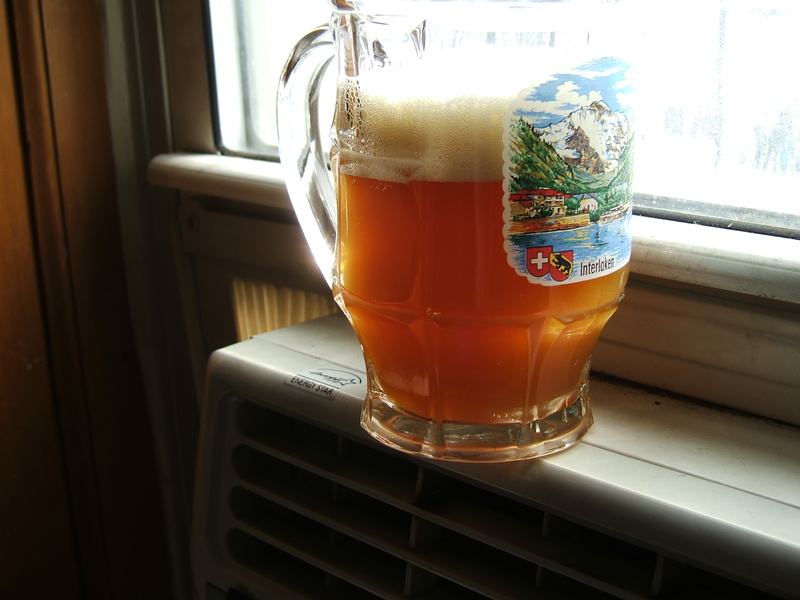 Maybe even be able to sell our beer straight from the beer garden located at the farm, much like a winery! In the end it has been great to use the land to benefit my hobby and we look forward to our third year and hopefully a full yield out of our Cascade plants. We most likely will expand and double our plot next year so if anyone has any good suggestions on particular varieties/favorite varieties, let us know. Initially I wanted to plant really rare and unique varieties, but being rare also means not finding the rhizomes. Regardless we will plant more of these varieties and perhaps round out the portfolio with the other “hybrid noble” hop varieties. Lastly, harvest is right around the corner and Chris is hoping to help out this year and take some home for everyone to try. If anyone has any suggestions or interest in helping out or a visit someday, let us know! More to follow soon about harvesting, drying, and packaging.